We think it’s important for small businesses to understand the basics. Legal action is another string in your bow in getting back what’s yours. Legal action can be a very helpful tool for small business struggling with late payments. Yet, the prospect of doing the legal thing can be a bit scary. The legal world, like the economics profession has a habit of using language that makes the simple appear horrendously complex. Acronyms such as “NOP” seem like a treatment for an inner ear infection as opposed to something useful. In most instances if you want to start legal action you will need to complete a statement of claim and a notice of proceeding and a statement of claim. Once these documents are supplied or “served” as it’s known, the person has 25 working days to file a Statement of Defence if they are living in New Zealand. They don’t file or pay, you can apply to the court for a judgment on your claim (ie a judgment order). Crucially starting legal proceedings doesn’t mean guaranteed instant success. For example, if the amount is disputed and a decision cannot be reached the court may refer you to the disputes tribunal, if the amount is under $15,000. 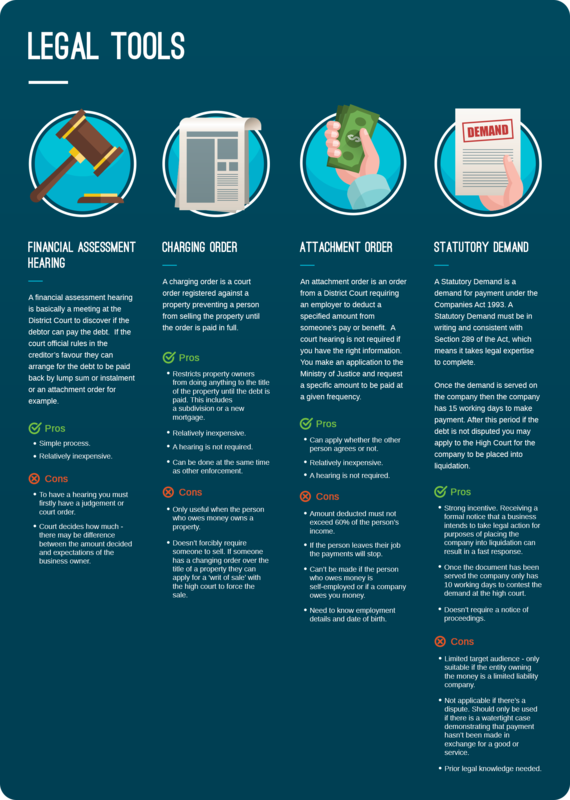 In the following graphic we have presented some of the legal tools at your disposal. WHEN SHOULD I GO DOWN THE LEGAL ROUTE? There are some general rules of thumb. - First, you should have made every effort to collect the amount outstanding as part of your invoicing process. - Secondly, the amount should be big enough that it’s worth the effort. A DIY legal approach isn’t for the faint hearted. You can’t really “wing it” like Dennis Denuto’s character in the much loved Australian film the Castle. Taking legal action for recovering a debt does require knowledge of court processes and the relevant legislation. Seeking the support and input from someone with experience in using legal tools for debt collection will give you a much greater chance of a positive outcome.